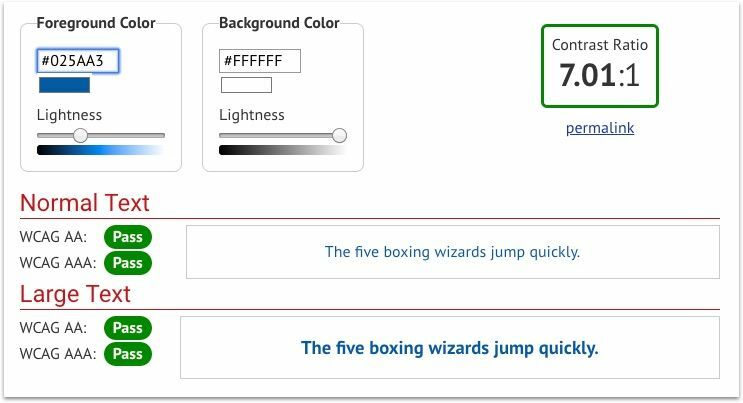 All text elements must have sufficient contrast between text in the foreground and background colours behind it in accordance with WCAG 2 AA contrast ratio thresholds. We as developers and/or designers forget about other people's limitations when it comes to the browser. We also forget that there is a very popular device called Screen Reader. We even forget our blind audiences. So does a blind person uses the internet? Yes! A staggering number to comprehend; out of the 7.3 million, how many actually visits our website? It's hard to tell but we must build our websites suited for anyone with low-vision. Before we design, one should already be thinking about such individuals with blindness or low-vision. We design by the guidelines of WCAG. As I designed this website, MayneWeb, I fell in love with a specific blue colour 027BDE. It was the only blue colour I pretty much used everywhere. Sadly it cannot be used on backgrounds where the foreground colour is white. Lighthouse complained about this, in the Audits, and provided a solution. The solution was understandable but I could not implement it. Basically I needed to darken my background so that the text is more visible. Darkened the background, while it's still blue, it was still failing. Doing a simple Google search "WCAG 2 AA contrast ratio", has led me to the marvellous website: WebAim. I tweaked my original blue colour until all WCAGs were passed. With this website in mind, I'm sure never to have an issue in my Audits results ever again.